Double layer navy ladies jacket. Machine washable. Sizes 10-24. 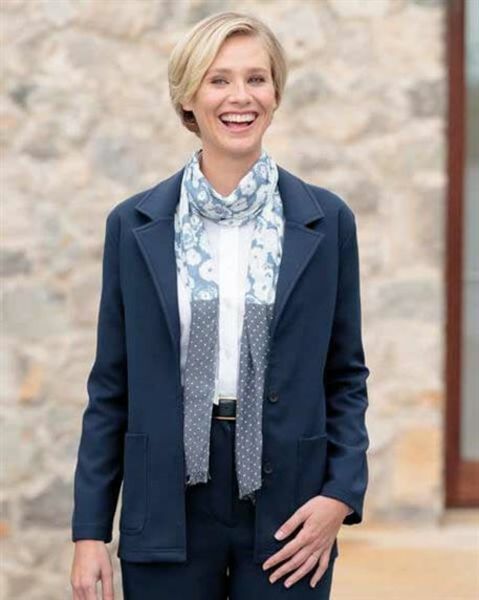 Ladies versatile, unstructured jacket with shoulder pads and gently shaped lapels. Front patch pockets and centre back seam with tonal buttons. Comfortable and cosy. Woven with a soft brushed inner for warmth and cut from easycare 64% polyester/34% rayon/2% spandex. An ideal piece to compliment any oufit.